1634599284 -The eighth edition of this pioneering casebook continues its tradition of comprehensive coverage, with problems and exercises that allow students to hone skills as counselors, as litigators, and as policy advisors. 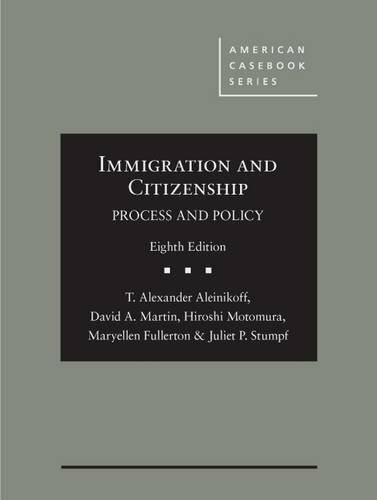 At the same time, the casebook helps students understand how immigration and citizenship law illuminates essential aspects of constitutional and administrative law and plays a key role in current political debates. This new edition is leaner, with significant reworking, thinning, and updating of core chapters on admissions categories, admission procedures, and removability. It also reflects the latest developments in federal enforcement, as well as state and local measures for both immigration enforcement and the integration of unauthorized migrants. The casebook incorporates important recent doctrinal changes, while trimming overall length.